For the original Austin Mini Countryman (1961–1969), see Mini. "All4" redirects here. For the video on demand service, see All 4. The Mini Countryman is a subcompact crossover SUV, the first vehicle of this type to be launched by Mini. It was launched in 2010 and received a facelift in 2014. The second generation vehicle came out in 2017. There is the 2008 Mini Crossover Concept which has four doors (2 right swing open, 1 left swing open, 1 left lift/sliding) and four single seats. It was unveiled at the 2008 Paris Motor Show. The 2010 Mini Beachcomber Concept was based on the Crossover Concept and the Mini Countryman, with no doors and no conventional roof. It included ALL4 all-wheel drive and offroad wheels. It was unveiled at the 2010 North American International Auto Show. The design of Mini's first five-door crossover echoed that of the Mini Crossover Concept. The production model was first unveiled at the 2010 Geneva Motor Show. UK models went on sale on 18 September 2010. The availability of models varies between markets, with the United States and Russia not taking the One versions or any diesel-powered models. The All4 all-wheel-drive option is available on variable models, again depending on the country. The ALL4 all-wheel-drive powertrain includes electro-hydraulic differential, positioned directly on the transmission's final drive, to vary the power distribution from front to rear. Under normal driving conditions, up to 50 percent of the engine's power goes to the rear wheels. Under “extreme” conditions ("extreme" being undefined) up to 100 percent heads to the back wheels. Early models included Cooper S, Cooper S ALL4, Cooper, One, Cooper D, Cooper D ALL4, and One D. Cooper SD, Cooper SD ALL4, Cooper D Automatic, Cooper D ALL4 Automatic were added from spring 2011. In 2012 the Countryman received some minor amendments, including an EU6 exhaust emissions standard compliance for the One and Cooper models, and using a different clutch material and improved software to reduce stalling problems. They went on sale from November 2012. A Cooper ALL4 model was added in July 2013. Changes to US 2014 model year range included the omission of the interior "Centre Rail" feature from the back seats. The rail is still present in the front. This is a race car version of Mini Cooper S ALL4 developed with Prodrive beginning in early 2009, with a 1.6-litre, four-cylinder turbo-charged engine from BMW Motorsport. The first test drive for the Mini Countryman WRC, which would also be available to customer teams, was planned for autumn 2010. It was unveiled at the Paris Show in 2010. The John Cooper Works is a derivative of the Cooper S ALL4 version of the Countryman, with increased engine power to 218 PS (160 kW; 215 hp) and 280 N⋅m (207 lb⋅ft) with over boost: 300 N⋅m (221 lb⋅ft). Steering, suspension, wheels and appearance have also been modified. It was unveiled at the 2012 International Geneva Motor Show, and went on sale in autumn 2012. US models receive reduced engine power to 211 PS (155 kW; 208 hp) and 260 N⋅m (192 lb⋅ft) (overboost:280 N⋅m (207 lb⋅ft)), and went on sale in July 2012 as a 2013 model year vehicle. In June 2011, Mini USA collaborated with rock band Kiss to create a quartet of one-off Countryman crossovers themed after the band. The cars were placed on auction on eBay, with proceeds going to UNICEF to help children affected by the Tōhoku earthquake and tsunami. The auction was able to raise US$129,000. Mini USA also sold replica vehicle wraps for Countryman owners through their website and dealerships. In November 2010, Euro NCAP awarded the Countryman a 5-star crash rating. Pulitzer Prize winning automotive journalist Dan Neil suggested the Countryman had jumped the shark – that is to say the car pushed the Mini ethos beyond relevance, marking the zenith of popularity and the start of decline. Neil suggested that by making a vehicle that is longer, wider and taller, the company had forsaken the inner logic of the brand: excellent handling in a tiny size. In a March 2011 review titled What Part of 'Mini' Did You Not Grasp, BMW? , Neil wrote "with the Countryman, tiny sharks have been jumped." The Countryman became Mini's second most popular model after the iconic Hardtop. The very first year of production it sold almost 50% more units than the Clubman, Convertible, and Coupe added together. 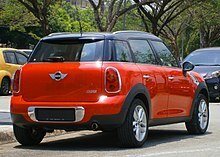 Almost 1 out of every 3 vehicles Mini sold in 2011 was a Countryman (U.S. market). This trend continued through 2012 also with almost 1 in 3 MINIs sold again being a Countryman - both in the US and globally. By the end of 2013 the Countryman was 31% of total U.S. sales for the Mini brand. A minor facelift to the Countryman was unveiled at the 2014 New York International Auto Show. Changes include a new structure of the hexagonal radiator grill, underride guard elements for the Cooper S Countryman ALL4 and additional body colour options. It went on sale in July 2014. All variants carried over. US variants include Cooper, Cooper S, Cooper S ALL4, John Cooper Works (with ALL4), with 6-speed manual transmission or optional 6-speed automatic transmission. The second generation Countryman was introduced at the LA Auto Show in November 2016, and go on sale in February 2017 in Europe, and March elsewhere. It was launched with three variants: Cooper (FWD or ALL4), Cooper S (FWD or ALL4), and in June 2017, the new Cooper S E ALL4 plug-in hybrid. The new Countryman is 8 inches (200 mm) longer than the first generation, and 1-inch (25 mm) wider. The Cooper Countryman will be powered by a turbocharged 3-cylinder engine, while the Cooper S will use a new 2.0 liter turbo I4. 2 emissions of 49 grams per kilometer. The 6.1 kWh lithium-ion battery is positioned directly in front of the electric motor underneath the rear seat, delivering an all-electric range of up to 40 km (25 mi) and a top speed of 126 km/h (78 mph). Charging at a 240-volt socket takes 3 hours and 15 minutes. In May 2017, Euro NCAP awarded the Countryman a 5-star crash rating. In July 2010, Mini announced plans to enter the World Rally Championship (WRC) with the Countryman beginning in 2011, and entering season-long tournament starting from 2012. The factory team had its first test outing of the 2011 WRC season at the 2011 Rally d'Italia Sardegna, before taking on the full calendar in 2012 and 2013. In the Intercontinental Rally Challenge, the RRC version had its first win at the 2012 Tour de Corse, driven by Dani Sordo. After just one season Mini terminated its works involvement in the World Rally Championship. The car continued to be used outside of the WRC, and won the 2012 Qatar International Rally and 2014 Barum Czech Rally Zlín, also taking podium finishes at the 2013 Rally of Lebanon. The All4, equipped with a straight-six engine, has won the Dakar Rally 4 straight years beginning in 2012, with Stéphane Peterhansel driving in 2012 and cars from German Monster Energy X-raid Team won the 2013 Dakar Rally. Mini won the car category of the 2014 Dakar Rally with the All4 driven by Nani Roma. Another overall win in the 2015 Dakar Rally made it four straight wins, with a 100% finish rate. The same team won the Abu Dhabi Desert Challenge four times from 2011, with other wins in the Baja Aragón, Desafio Ruta and Desafio Inca, and being the runner-up in the 2011 Silk Way Rally, 2012 Desafio Litoral Rally and 2015 Baja Russia Northern Forest. Khalifa Al Mutaiwei win the FIA Cross Country Rally World Cup in 2012, Krzysztof Holowczyc in 2013, Vladimir Vasilyev in 2014, and Nasser Al-Attiyah in 2015. Jean-Philippe Dayraut used a Mini Countryman to win the Andros Trophy ice racing championship in 2013 and 2014. A 900 bhp vehicle based on the Mini Countryman entered the 2013 Pikes Peak International Hillclimb, finishing third overall. Team JRM entered the 2015 FIA World Rallycross Championship season, acquired ex-Prodrive Minis, which unlike its competitors, using 1.6-litre engine with some concessions so the cars were able to competing with 2.0-litre engine cars. Guy Wilks reaching the final in the British round. It was also entered into the 2013 Global RallyCross Championship, with Liam Doran winning the Munich round. A further car was entered into the 2015 FIA European Rallycross Championship season, driven by Riku Tahko. The team eventually entering FIA World Rallycross full-time, with Liam Doran as the driver. The Minis losing its concessions, as they debuted their self developed 2.0-litre engine in the 4th round in Great Britain. The first generation Countryman was primarily built in Graz, Austria under contract by Magna Steyr, making it the first of the BMW era Minis to be manufactured entirely outside the UK. In 2013, assembly of the Countryman was expanded to three international locations: from April 2013 at BMW's plant near Chennai, India, specifically for the Indian market from June 2013 at the BMW Group Malaysia Assembly Plant in Kulim, Kedah, and at the BMW Manufacturing Thailand plant in Rayong from August 2013. In 2012, worldwide sales of Countryman reached 102,000 units, 21,012 of which were sold in the US. In March 2013, the 250,000th Countryman was produced at Magna Steyr's Graz plant. Since November 2016 the second generation Countryman will only be assembled at VDL Nedcar in Born, the Netherlands. ^ "Paris Preview: 2010 MINI Crossover Concept". Autoblog. Retrieved 8 December 2018. ^ "Paris 2008: MINI Crossover Concept". Autoblog. Retrieved 8 December 2018. ^ "The Sky is the Limit: The MINI Beachcomber Concept". www.press.bmwgroup.com. Retrieved 8 December 2018. ^ "MINI at the NAIAS Detroit 2010". www.press.bmwgroup.com. Retrieved 8 December 2018. ^ "Detroit Preview: MINI Beachcomber concept". Autoblog. Retrieved 8 December 2018. ^ "MINI at the 80th Geneva Motor Show 2010". www.press.bmwgroup.com. Retrieved 8 December 2018. ^ "Geneva 2010: Mini Countryman breaks cover". Autoblog. Retrieved 8 December 2018. ^ "Mini Countryman priced in the UK from £16K". Autoblog. Retrieved 8 December 2018. ^ "MINI Countryman - official!". Auto Express. 20 January 2010. Retrieved 2 February 2011. ^ "The MINI Countryman, Fun has no Limits". Automoblog.net. ^ "Fun has no limits. The MINI Countryman". www.press.bmwgroup.com. Retrieved 8 December 2018. ^ "Specifications MINI Countryman". www.press.bmwgroup.com. Retrieved 8 December 2018. ^ "Mini dishes out more info on Countryman including complete specs". Autoblog. Retrieved 8 December 2018. ^ "MINI in 2011: More power, more sportiness, more individuality. Premiere of the MINI Cooper SD with 2.0-litre turbodiesel engine and 105 kW/143 hp – John Cooper Works Pack for the MINI and MINI Convertible – MINI Yours presents the MINI Clubman Hampton special edition". www.press.bmwgroup.com. Retrieved 8 December 2018. ^ "Specifications of the MINI Cooper SD models". www.press.bmwgroup.com. Retrieved 8 December 2018. ^ "Specifications of the MINI Cooper D models". www.press.bmwgroup.com. Retrieved 8 December 2018. ^ "Mini fesses up to Countryman clutch issue, plans fix". Autoblog. Retrieved 8 December 2018. ^ Bridger, Gabriel (7 November 2012). "MINI Addresses Countryman Clutch Issue". Retrieved 8 December 2018. 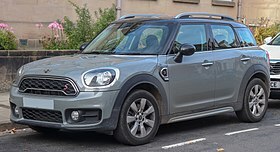 ^ "The MINI Countryman: Model update measures for autumn 2012". www.press.bmwgroup.com. Retrieved 8 December 2018. ^ "ALL4 times ten for maximum driving fun: MINI extends its range of all-wheel models to include the MINI Cooper Countryman and the MINI Cooper Paceman". www.press.bmwgroup.com. Retrieved 8 December 2018. ^ "Specifications of the MINI Cooper Countryman ALL4, 07/2013". www.press.bmwgroup.com. Retrieved 8 December 2018. ^ "2013 Mini Countryman gets updates". Autoblog. Retrieved 8 December 2018. ^ "Mini deletes center rail in Countryman, Paceman". Autoblog. Retrieved 8 December 2018. ^ "Mini confirms entry into 2011 World Rally Championship with Countryman". Autoblog. Retrieved 8 December 2018. ^ "MINI at the 2010 Paris Motor Show". www.press.bmwgroup.com. Retrieved 8 December 2018. ^ "Paris 2010: Mini Countryman WRC looks the part". Autoblog. Retrieved 8 December 2018. ^ Parrott, Vicky (7 September 2012). "First drive: Mini Countryman John Cooper Works". Autocar. Retrieved 28 April 2014. ^ "2013 Mini John Cooper Works Countryman packs an up-sized punch". Autoblog. Retrieved 8 December 2018. ^ "Mini adds revised powertrain, automatic option to John Cooper Works models". Autoblog. Retrieved 8 December 2018. ^ Glucker, Jeff (1 June 2011). "KISS-themed Mini Countryman one-offs rock on to eBay Motors for charity". Autoblog. Retrieved 7 August 2017. ^ Boeriu, Horatio (30 June 2011). "$129,000 raised from auction of 4 KISS MINI Countryman". BMWBlog. Retrieved 7 August 2017. ^ "MINI Countryman granted 5-star crash rating". AUSmotive.com. 25 November 2010. Retrieved 25 November 2010. ^ "Euro NCAP results for Mini Countryman" (PDF). euroncap.com. 2011. ^ "What Part of 'Mini' Did You Not Grasp, BMW?". The Wall Street Journal, 4 March 2011, Dan Neil. 5 March 2011. ^ Bridger, Gabriel (1 December 2011). "MINI USA Sales up 70.5% for November". Retrieved 8 December 2018. ^ Bridger, Gabriel (18 January 2013). "A Look Back at MINI's Record Breaking 2012 Sales". Retrieved 8 December 2018. ^ Bridger, Gabriel (5 December 2013). "MINI USA Sales Down 13% for November". Retrieved 8 December 2018. ^ Hudson, Paul (16 April 2014). "New Mini Countryman revealed". Daily Telegraph. Retrieved 28 April 2014. ^ "Mini lifts veil on refreshed Countryman in New York". Autoblog. Retrieved 8 December 2018. ^ "MINI at the New York International Auto Show 2014". www.press.bmwgroup.com. Retrieved 8 December 2018. ^ "Driving fun for every occasion: The new MINI Countryman". www.press.bmwgroup.com. Retrieved 8 December 2018. ^ Millikin, Mike (26 October 2016). "MINI Cooper S E Countryman ALL4 plug-in hybrid on sale in June 2017". Green Car Congress. Retrieved 25 February 2017. ^ "Mini Countryman John Cooper Works 2017 review Autocar". www.autocar.co.uk. Retrieved 8 December 2018. ^ Nica, Gabriel (11 December 2017). "2017 MINI Countryman John Cooper Works Review – On the Edge". Retrieved 8 December 2018. ^ "Gas Mileage of 2018 MINI John Cooper Works". www.fueleconomy.gov. Retrieved 8 December 2018. ^ "MINI Countryman 2017 granted 5-star crash rating". euroncap.com. ^ "MINI confirms WRC entry from 2011". AUSmotive.com. ^ "MINI set to join World Rally Championship from 2011". www.press.bmwgroup.com. Retrieved 8 December 2018. ^ "Mini exiting WRC after just one year". Autoblog. Retrieved 8 December 2018. ^ "Mini Countryman Wins the Dakar 2012, Peterhansel Records 10th Victory [Video]". 17 January 2012. Retrieved 8 December 2018. ^ Vijayenthiran, Viknesh. "X-Raid Team Drives MINI Countryman To Second Consecutive Dakar Rally Win". Motor Authority. Retrieved 8 December 2018. ^ "Mission title defence: MINI Countryman in the 2013 Dakar Rally". www.press.bmwgroup.com. Retrieved 8 December 2018. ^ "Mini celebrates racing success with John Cooper Works Countryman ALL4 Dakar Winner 2013". Autoblog. Retrieved 8 December 2018. ^ Moss, Darren (20 January 2014). "Mini wins 2014 Dakar Rally". Autocar. Retrieved 28 April 2014. ^ Mini. "MINI Countryman getting ready for Pikes Peak [video]". Motor1.com. Retrieved 8 December 2018. ^ "Mini Countryman 2010-2017 Review (2018) - Autocar". www.autocar.co.uk. Retrieved 8 December 2018. ^ Reporter, B. S. (18 April 2013). "BMW to make MINI Countryman in Chennai". Retrieved 8 December 2018 – via Business Standard. ^ CHOUDHURY, SANTANU (18 April 2013). "BMW Starts Production of Mini in India". Wall Street Journal. Retrieved 18 April 2013. ^ "Locally assembled MINI Countryman unveiled". Star Motoring. 14 June 2013. Archived from the original on 16 February 2014. Retrieved 28 April 2014. ^ "BMW Group Thailand begins local assembly of Mini Countryman". Bangkok Business Brief. 14 August 2013. Retrieved 29 October 2013. ^ "Elegant stylist meets talented all-rounder: The MINI Paceman and MINI Countryman bring more variety and driving fun to the premium compact segment". www.press.bmwgroup.com. Retrieved 8 December 2018. ^ "Breaking a record to mark an anniversary: MINI continues its success story in the USA". www.press.bmwgroup.com. Retrieved 8 December 2018. ^ "Talented all-rounder and bestseller: The 250,000th MINI Countryman leaves the factory". www.press.bmwgroup.com. Retrieved 8 December 2018. ^ "VDL Nedcar - VDL Nedcar gaat de nieuwe MINI Countryman produceren". www.vdlnedcar.nl. Retrieved 8 December 2018. Wikimedia Commons has media related to Mini Countryman.